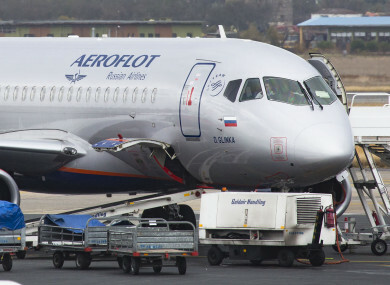 BRITISH AUTHORITIES SAID that border officials had searched an incoming Aeroflot plane, a move Russia called an act of “blatant provocation” in the ongoing diplomatic spat between London and Moscow. Britain said it conducts routine checks on aircraft to protect the UK from organised crime and people attempting to bring harmful substances into the country. The Russian embassy in London said Friday’s search on a scheduled plane arriving from Moscow at London Heathrow Airport was “extraordinary”. Britain’s Security Minister Ben Wallace said in a statement: “It is routine for Border Force to search aircraft to protect the UK from organised crime and from those who attempt to bring harmful substances like drugs or firearms into the country. The Russian embassy suggested the jet had been searched in connection with the diplomatic crisis over the poisoning of former double agent Sergei Skripal and his daughter on British soil earlier this month. The embassy claimed British officials at first tried to search the plane without the crew, although the captain was eventually allowed to be present. It claimed their requests for clarification on the search had been met with no response. “We have no other explanation but that the incident at Heathrow is in one way or another connected with the hostile policy that the UK government is conducting with regard to Russia,” it said. Relations between Russia and the West have been plunged into crisis following the first use of chemical weapons in Europe since World War II. Skripal, who came to Britain in a spy swap, and his daughter Yulia have been in hospital since 4 March after they were poisoned in the southwestern English city of Salisbury. British authorities say a Soviet-designed nerve agent dubbed Novichok was used. London, supported by its major Western allies, says there is no alternative conclusion other than Russian state involvement. Moscow denies being behind the attack. The Organisation for the Prohibition of Chemical Weapons is verifying Britain’s findings. Email “British officials search inbound plane from Moscow over security fears ”. Feedback on “British officials search inbound plane from Moscow over security fears ”.